Each bay will have either a 4 post, 2 post or scissor lift. 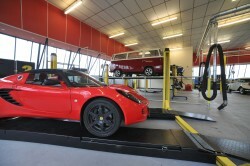 We will advise which lift is best for you depending on your vehicle and the work you wish to carry out. If we know in advance of your booking what you intend to do and to what vehicle we will always do our best to have the tools you need on site. The Engine Room is a clean room for the final assembly of engine, gearbox and other drive train components. We will have various stands available and the room will contain several sturdy work benches to handle the weight of even the largest engines. The room will be available to hire in the same way as work bays. Keeping you and all of our customers safe is a top priority for TIYG. All of our work bays and other work areas will be designed to be as safe as possible. Before anyone can use the facilities they will have to complete a full induction that will familiarise the user with the equipment and safety processes. Each bay will have a comprehensive first aid kit as well as the required fire protection systems. After you have completed your work we hope that you will come and join us for a relaxing drink and maybe a bite to eat in “The Club”. Should you want to freshen up before heading upstairs (we might insist if you are too filthy!) or if you have come in straight from work and need to change before working on your vehicle we have full changing and showering facilities on-site. 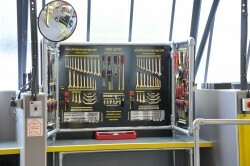 There is also a wash station situated in the workshop if you just need to clean your hands after your time in the bay. The Workshop is the “engine room” of TIYG. We have 7 work bays at TIYG all equipped with a comprehensive tool kit, 4 post, 2 post or scissor lift, work bench and seating area. For more information about the facilities we offer please click on the links below. Please click on the buttons below to view more information.